Staining of ovine peripheral blood lymphocytes with Mouse anti Sheep CD25 (MCA2218GA) followed by Goat anti Mouse IgG (H/L):FITC (STAR117F). Ovine blood was stimulated for 48 hours with 10 µg/ml LPS and 10 µg/ml PHA prior to staining. Mouse anti sheep CD25, clone 9.14 recognizes the ovine homologue of human CD25, also known as interleukin-2 receptor alpha chain (IL-2Rα), a single pass type I membrane protein expressed by activated ovine T-cells. Ovine Interleukin-2 is a cytokine involved in the proliferation, growth and differentiation of T-cells, B-cells and NK cells and its receptor is composed of 3 subunits, an α chain (CD25), a β chain (CD122) and a γ chain (CD132). A non-covalent association of the α and β subunits is required to form the high affinity receptor for IL-2. 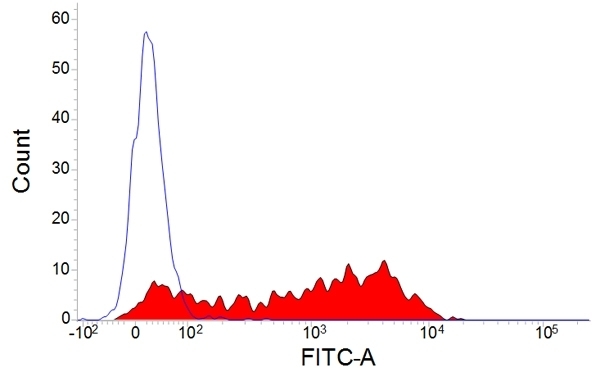 Immunoprecipitation studies have demonstrated that clone 9.14 precipitates a band of approximately 47 kDa under reducing conditions, which is that expected of the mature protein due to high glycosylation, and is consistent with the observed molecular weight of IL-2Rα in other species such as humans (Verhagen et. al.1993). Research has demonstrated that antibodies to CD4, FoxP3 and CD25 may be used in studies of T regulatory cells (T-regs), a unique subset of T helper cells that function in the control of effector cells vital in preventing autoimmunity (Rocchi et. al. 2011). Mouse anti sheep CD25, clone 9.14 is one of a wide range of monoclonal antibodies available from Bio-Rad for ovine research and provides an important tool for the identification of ovine CD25 and may be of used in facilitating further studies of T-regs in this species. Verhagen, A.M. et al. (1993) Characterization of the ovine interleukin-2 receptor-alpha chain: differential induction on precultured alpha beta and gamma delta T cells. Gillan, S. et al. (2010) Identification of immune parameters to differentiate disease states among sheep infected with Mycobacterium avium subsp. paratuberculosis. Clin Vaccine Immunol. 17: 108-17. Gillan, S. et al. (2010) Ovine immune parameters following immunisation against Mycobacterium avium ssp. paratuberculosis using a lipid-based live-cell vaccine. Vet Immunol Immunopathol. 137 (1-2): 109-19. Rocchi, M.S. et al. (2011) Identification of CD4+CD25 high Foxp3+ T cells in ovine peripheral blood. Vet Immunol Immunopathol. 144 (1-2): 172-7.